Figure 1: Foliage and fruit of a naranjilla (Solanum quitoense ‘Julio Rivera’) plant transplanted on 14 August 2014 into the rainforest section of the ECHO Farm in southwest Florida. Photos taken on 2 July 2015 by Tim Motis. Naranjilla (pronounced na-ran-hee-ya) means ‘little orange’ in Spanish, but it is not a citrus crop. It is actually a relative of tomato, eggplant and pepper, being a member of the Solanaceae (also known as ‘nightshade’) family. Grown for its yellow to orange fruits (Fig. 1), it has been described as “the golden fruit of the Andes.” Naranjilla is high in vitamin C (31-84 mg of ascorbic acid/100 g of fresh fruit) and makes excellent juice with a unique and delicious tropical flavor that tastes like a blend of pineapple and lemon. It is also used in ice cream, sherbets, jellies and jams. Though protected by a covering of brown hairs, naranjilla fruit can be eaten raw by rubbing off the hairs (easily done with ripe fruit), cutting the fruit in half and then squeezing the juice—along with the edible pulp and seeds—into the mouth. Inside, green and yellow sections of flesh are partitioned by thin membranous walls. The fruits reach about 5 cm in diameter and are borne in clusters on perennial shrubs reaching up to 2.4 m (8 ft) in height. Depending on the variety, the large purple leaves can be spiny (wild types) or spineless (cultivated types). The stems become somewhat woody as the plants mature. Where does it grow best? Originating from northern portions of South America, naranjilla prefers cooler areas of the tropics and is a good crop to consider for higher elevations (900-2400 m [3000-7900 ft]). It grows best with temperatures below 30°C (86°F) and is intolerant of frost. Naranjilla grows under full sun but may benefit from partial shade, especially at lower altitudes where temperatures can rise above 30°C. The plant shown in figure 1 is growing near sea-level, on ECHO’s Global Demonstration Farm, with sunlight filtered through the canopy of surrounding trees. Naranjilla prefers fertile, moist, and well-drained soil. The plants do not tolerate flooded conditions. Annual rainfall of 1500 mm (60 in), distributed evenly throughout the year, is optimal. Although it can be grown from cuttings, naranjilla is propagated most commonly by seeds. Seeds collected from mature fruit can be processed similarly as one would for eggplant. In Latin America, naranjilla seeds are allowed to ferment in the shade, after which they are washed with water (to remove the pulp from around the seeds) and air dried. At ECHO’s seed bank in Florida, the seeds are simply rinsed and then air dried. At planting time, the seeds are sown in a shaded nursery area, either on a raised bed or in plastic bags. When the seedlings reach 10 to 15 cm (4 to 6 in) in height, two to three months after sowing, they are transplanted into planting holes dug 30 cm wide X 30 cm deep (12 X 12 in) and enriched with liberal amounts (up to 4 kg [8.8 lbs]) of organic compost. Dig planting holes about 2 m (7 ft) apart, within and between rows, to give the shrubs plenty of growing space. Naranjilla is a heavy feeder and will grow most rapidly if supplied with monthly applications of NPK fertilizer or manure tea. Water the plants during dry periods. What are some pests to watch for? Rootknot nematode (Meloidogyne sp.) is the main pest of naranjilla. Damaged roots result in stunted and chlorotic (nutrient deficient) plants that may only produce fruit for one year. 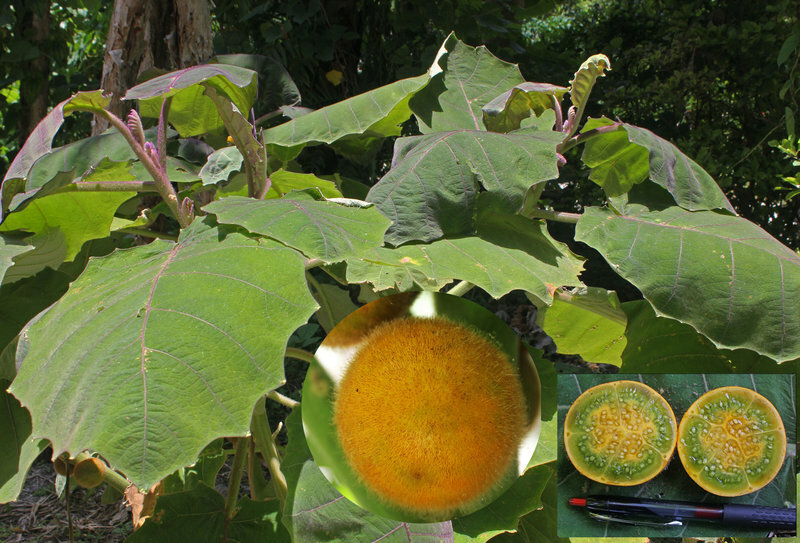 Naranjilla can be grafted onto rootstock of other closely-related, nematode-resistant species (e.g., Solanum macranthum rootstock has succeeded in Florida; S. torvum in parts of Africa). For household plants, a more practical option for avoiding nematodes is to grow a few plants in containers filled with nematode-free soil or other clean planting media; large containers are best considering the size of the plants and their high demand for moisture. Other pests include scale on the fruits and stem rots caused by bacteria. Wild forms, though spiny, are said to be more tolerant of pests and diseases than domesticated varieties. How long does it take to produce fruit? Fruiting begins 10 to 12 months after seed sowing, continuing for as long as three or four years before the plants begin to decline. In Florida, fruit production continues for two years before the plants are replaced. A healthy plant produces 100 to 150 fruits each year. Harvest the fruits every seven to 10 days. How are the fruits harvested? When picking the fruits, protect hands from the sharp, fuzzy hairs by using gloves or cloth. This is particularly important for people with sensitive skin. For household consumption of fresh fruit, pick the fruits when they are fully ripe, at which time the fruit will be a dark orange color and the hairy fuzz can easily be rubbed off on the ground (in the grass) or with a cloth. Fully ripe fruits soften quickly and are susceptible to bruising and discoloration, which makes it difficult to ship them long distances. By harvesting and cleaning before they are fully ripe, the fruits can be stored for up to eight days without refrigeration. ECHO’s seed bank currently carries two naranjilla varieties, one an unnamed variety and the other a variety from Puerto Rico called ‘Julio Rivera’ that has relatively spineless leaves. Members of ECHO’s network who are active development workers may request a complementary, sample packet of seed. If you have not already done so and would like to, please see www.ECHOcommunity.org for information on how to register and receive seeds. If you obtain seed from ECHO, be sure to fill out a seed harvest report, which will give us a more accurate idea of how well this crop performs under varying conditions. Tindall, H.D. 1983. In: Vegetables in the Tropics, 371-372. The MacMillan Press Ltd.